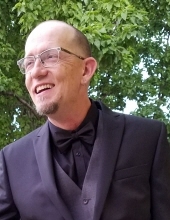 Funeral services for Daniel Russell Kinard, II, age 44 will be held at 2:00 P.M. Saturday, April 13, 2019 in the Chan Stanley Memorial Chapel of Stanley Funeral Home and Crematory. Rev. Joey Diers will officiate. Mr. Kinard was born October 29, 1974 in Tampa, Florida. He was a truck driver. He served in the United States Marine Corps. Mr. Kinard passed away Monday, April 8, 2019 at Penrose Hospital in Colorado Springs, CO.
Mr. Kinard is survived by his wife, Brenda Michelle Kinard of Dublin, his father and stepmother, Daniel Russell and Brenda Kinard of Dublin, his mother, Debra Lee and Tony Walker of Lakeland, FL, his son, Elijah Kinard of Orlando, FL, 3 daughters, Darla Dawn Kinard of Dublin, Devin Kinard (Justin) Graham of Jacksonville, NC, and Zoey Kinard of Orlando, FL, 3 brothers, Marshall Dee Kinard of Byron, Chris (Sarah) Baggett of Dublin, and Ben (Kassandra) Giegrich of Dublin, and 6 sisters, Tanya (Scott) Welch of Ocala, FL, Kimberly (Travis) Million of Rentz, Stephanie Amber Kinard of CA, Stephanie (Daniel) Lampp of Rentz, Tanoi (Jeremy) Vuylsteke of Lakeland, FL, and Tamara Walker of Lakeland, FL. The family will receive friends from 1:00 P.M. until 1:45 PM. Saturday, April 13, 2019 at the funeral home. Stanley Funeral Home and Crematory/Dublin Chapel has charge of funeral arrangements. To send flowers or a remembrance gift to the family of Daniel Russell Kinard, please visit our Tribute Store. "Email Address" would like to share the life celebration of Daniel Russell Kinard. Click on the "link" to go to share a favorite memory or leave a condolence message for the family.